The INK+IVY Ankara Cotton Printed Panel can update your windows with a refreshing touch of color and pattern. 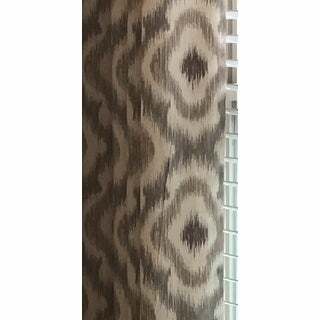 Featuring a beautiful multi ikat print in muted and neutral hues, this cotton window curtain revitalizes any room with its stylish look. Made from 100-percent cotton, this window panel is easy to care for and provides a soft texture for a natural update. Silver grommet top detail makes it easier to hang, open, and close this window curtain throughout the day. Fits up to a 1.25-inch diameter rod. Heavy weight and very nice. The actual colors are a little different than they appear in the picture. I ordered the taupe and both the gray and taupe colors are darker than they appear in the picture but still pleased with my purchase. I ordered two panels. When they arived and I hung them up I realized one was longer than the other. I ordered 108 inches for both and that was how the packaging was marked but one panel was 108 the other 110 inches. I loved the look of the panels and was exactly what I was looking for in color and design so I decided to cut the longer one an rehem. Good thing I can sew and have a sewing machine. I would have sent it back but this was the second time ordering as they sent me a wrong size before of 86 inches. gorgeous! just note there is only one per package! Love the cloth, love the thickness. I ordered 4 of these. On my windows, I have shutters so I never close them so the mismatch of the fabric is fine. But if you want your curtains to come together and look like one piece of cloth, beware. None of my 4 curtains are an exact match with any other. 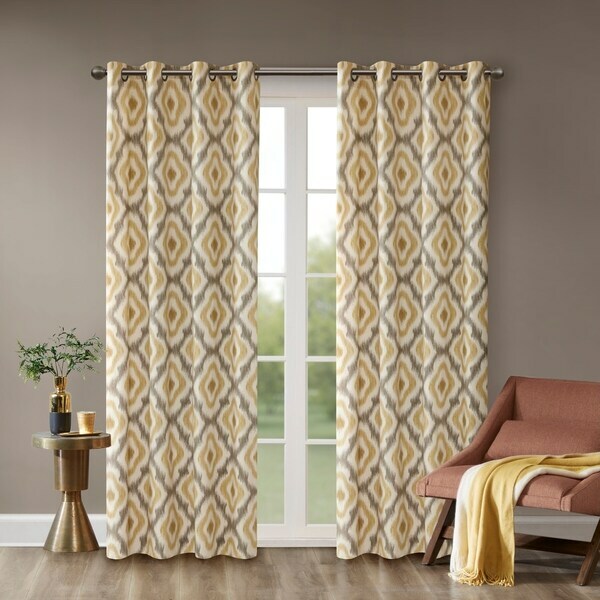 If that's a must for you, you may want to call in your order and ask them to make sure the grommets of both of your curtains are in the same place on the pattern of the cloth. You can tell from the unopened pack if you can just get someone who will do that for you. But they look great in my space since they didn't have to meet. I'm happy with the price and quality. 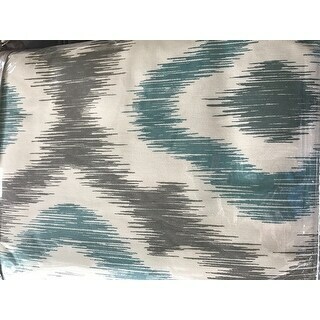 Just wonderful, fabric is very nice, overall very pleased. Make sure you realize it is only one panel, though. Little pricey considering I had to buy 4! These look great! They all arrived exactly the same length. I am very happy with this purchase so far. 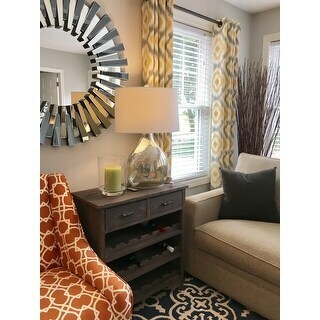 I debated getting custom drapes for the family room but settled for these because they were so reasonably. So glad I did, they look awesome and I save a bundle. I purchased these for 2 of my windows in my office. I love them!! Love the design and the grommets...easy for opening and closing. Can't say yet, obviously, how they hold up in washing, but so far.....thumbs up!!! There is no white on the curtains. Instead it's beige. The curtains are cotton...I think. Save your money and go to the store and buy the curtain. That way you can see what color you are purchasing. These curtain panels are beautiful. They hang perfectly and make my guest room look so complete and pulled together. They are all cotton, so they press nicely and are heavy enough to not need lining. Color was not as advertised and the quality of material was subpar and drab. I love my curtains. The fabric is great and the fold creases fell out (without ironing) within a few days on hanging. The only warning I give is that these curtains are very beige- there is no white at all. Perfect and looks great in my space. 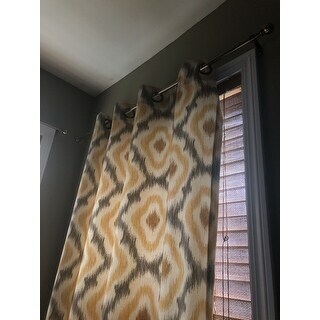 These curtains looked much different than the pictures on the website. They were not what I was looking for to match my decor. Overstock was extremely accommodating with my return. The curtains did appear to be of good quality. However I returned the set so I can not comment on how durable they are. The panels are nice quality, seem to be made nicely. Would definitely order from the manufacturer again. I returned the curtains because they did not fit my windows. The curtains quality where just fine they just didn’t fit. The process and agent a I used was not easy and they charged me with a large return fee. 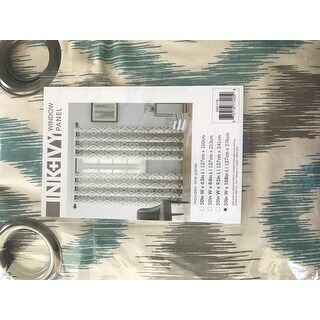 I purchase is window treatments for my client and she loved them. Great Buy! Very pretty, look just like photos. Nice curtains. They hang nicely and look as I expected. Worked for the space, but looked a little cheap. "I'm interested in the spice pattern in 108 length. Is it just out of stock or will it never be available in this length?" This has been discontinued, so we are unlikely to get any more in stock. "I just ordered these curtains a few days ago and now you have a sale on them. Just wondering if I can get the sale price on them?" "Is the 'Spice' Color panel more on the orange tones or red?" "Just ordered these, I only see it's a panel per order, so it's not a complete set?" Hello Jo, I apologize for the confusion this listing is just for 1 panel. Thanks for shopping with us! "Are the yellow panels grey and yellow or taupe and yellow?" Hello jacqueline67, we try to represent the colors of our products accurately. Unfortunately, due to the difference in monitor colors we cannot guarantee that the color will match exactly what you see on your screen. Thank you for shopping with us. "How wide are the curtains?" Hello Admeer, each panel is approximately 50 inches wide. Thanks for shopping with us! "how large of a rod will the grommet take? I have a large rod and it appears that it wont take but a skinny rod. Thanks"
Hello elb682, this grommet window panel is designed to fit 1.25 inch diameter rod. Have a great day!